Luke Fletcher’s career best bowling performance and a half century from Ross Taylor steered Nottinghamshire into a position of strength on day three of the Specsavers County Championship match with Worcestershire at Blackfinch New Road. Fletcher ripped through the middle and lower Worcestershire order to finish with 5-27 after an uncontested toss as the home side were bowled out for 110 in just 26.3 overs. Then New Zealand batsman Taylor showed his class in making exactly 50 as Nottinghamshire achieved a lead of 94 in reaching 204-6 before bad light ended play with 11 overs remaining. Fletcher had suffered a severe bout of concussion which ruled him out of the second half of last season after being struck by a straight drive from Warwickshire’s Sam Hain in a T20 Blast match at Edgbaston. But the 29-year-old has started the new season in good form and followed up his 4-47 against Yorkshire at Headingley with his best ever figures. It surpassed the 5-52 against Warwickshire at Trent Bridge in 2013 – his previous five-for before today’s deadly spell. Nottinghamshire will now look to press on with their first innings tomorrow morning and then bowl Worcestershire out cheaply for a second time despite the wash-out of the opening two days. England pace duo Jake Ball and Stuart Broad – making his first Championship appearance of the season - shared the new ball and reduced Worcestershire to 3-3 inside three overs. Ball bowled Daryl Mitchell (0) with a ball of full length and had Brett D’Oliveira (3) pouched at third slip while in between Broad claimed his 200th Championship wicket as he trapped Tom Fell (0) lbw. The bat then got on top of ball for the only time in the innings as Joe Clarke and Travis Head, who was making his home debut, added 65 for the fourth wicket in 11 overs. 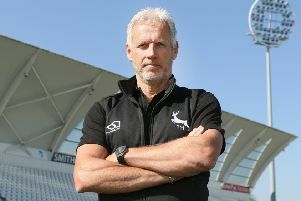 Clarke hit seven fours in his 42 off 35 balls, many the product of scorching cover drives, but the introduction of Fletcher into the attack swung the game firmly in Nottinghamshire’s favour. Clarke nicked through to second slip after aiming a drive, George Rhodes (0) shouldered arms, Ben Cox (3) nicked through to the keeper after trying to take his bat away and Head (33) was leg before. Broad returned to the attack to bowl Ed Barnard (4) via the inside edge and Charlie Morris (3) while in between Fletcher completed his nap hand as skipper Joe Leach (12) lost his leg bail. Broad ended with 3-28 and Ball 2-25. Worcestershire needed to make early inroads to haul themselves back into the game and their attack included Charlie Morris – playing his first senior game for 19 months – in place of the injured Steve Magoffin. Leach quickly accounted for Jake Libby (9) who nicked through to Mitchell low at second slip and Steven Mullaney (28) was lbw to Josh Tongue. Taylor played fluently and a partnership of 78 in 21 overs with Chris Nash (26) steered Nottinghamshire into the lead. A flurry of three wickets in the space of five overs offered encouragement to Worcestershire after tea. Nine overs were lost for bad light and when the players returned Barnard bowled Riki Wessels (36) to end a stand of 55 with Tom Moores.